Volvo said its performance is being helped by strong demand for the XC60. Volvo Car Corp., owned by China's Zhejiang Geely Holding Group Co., made an operating profit in the third quarter, the Swedish carmaker said on Friday. Volvo, which Geely bought from Ford Motor Co. on Aug. 2, did not disclose details, but said it has been profitable since the start of the year. "This gives us a good platform in our aim for a full-year positive result," Volvo CEO Stefan Jacoby said in a statement. The company said Friday that it will provide detailed results when it releases its 2010 full-year earnings report, which is due in early 2011. Geely paid Ford $1.3 billion in cash for Volvo and issued a $200 million note to the U.S. group with further payment due later this year. Geely's purchase of Volvo was China's biggest acquisition of a foreign car maker and reflects the nation's rapid rise in the auto world. 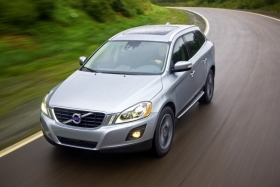 Volvo said its performance is being helped by strong demand for the XC60, its top-selling model.